For code you need to make a choice whether you are comfortable with assembly or C language ? Never Leave it until you did it. Wow, from doing your first flashing led yesterday you are now onto glcds !! There are so many types of glcd, and while their fuctions are similar they need a geat amount of code to get them working. If you can use a complier that has libraries for that glcd then the problems solved, however the one you have used is not very popular to my knowledge. I would strongly suggest while you are still starting to learn how to program then use one of the more popular standard LCD, any 16x2, HD447080 compatible like the LM016 in ISIS will do. Its easy to use and has been the standard display for so many Pic projects. If you want a micro system that will allow you to run glcds just by loading some existing coded then you prehpas need to look at a different approach. MikroE do complete systems, compliers and hardware including glcds that will do that, but at a high cost. Just try the glcd example in mikroC. Also connect MCLR pin to Vcc through 10k resistor. Can you zip and post your proteus file? Your GLCD can be used in parallel / serial mode. If P/S is 1 then it is in parallel mode. If P/S is 0 then it is serial mode. Last edited by internetuser2k12; 21st September 2012 at 18:18. I believe the issue maybe that you are attempting to utilize the MikroE GLCD library with a LM13232AFW based GLCD. I reviewed both the user manual and help system and I see no indication the library routines support the LM13232AFW chipset. The mikroC PRO for PIC provides a library for operating Graphic Lcd 128x64 (with commonly used Samsung KS108/KS107 controller). The mikroC PRO for PIC provides a library for operating Graphic Lcd 128x64 (with commonly used Samsung KS108/KS107 controller) via SPI interface. There are several KS108/KS107 compatible controllers available, however I do not believe the LM13232AFW chipset is one of them. Unfortunately, you will most likely need to either find a third party library which supports the LM13232AFW chipset or write your own routines. By the way, I was unable to open your Proteus simulation file, what version of the application are your currently using? I believe the library routines are the same regardless of which programming language you choose. In other words I don't believe they are compatible with the LM13232AFW chipset. I believe the image shows the pinout for the KS108/KS107 based GLCD, NOT the LM13232AFW based GLCD. Writing library routines for a GLCD which uses a new controller is quite nontrivial and can be extremely complex, too difficult for a beginning programmer. I would agree with wp100 and suggest you start off with a simple HD44780 compatible 16x2 LCD. Then after you have master it and you still wish to pursue the GLCD, I would suggest obtaining a KS108/KS107 based GLCD instead of the LM13232AFW based GLCD. Be aware the above tutorials are NOT compatible with your LM13232AFW based GLCD. 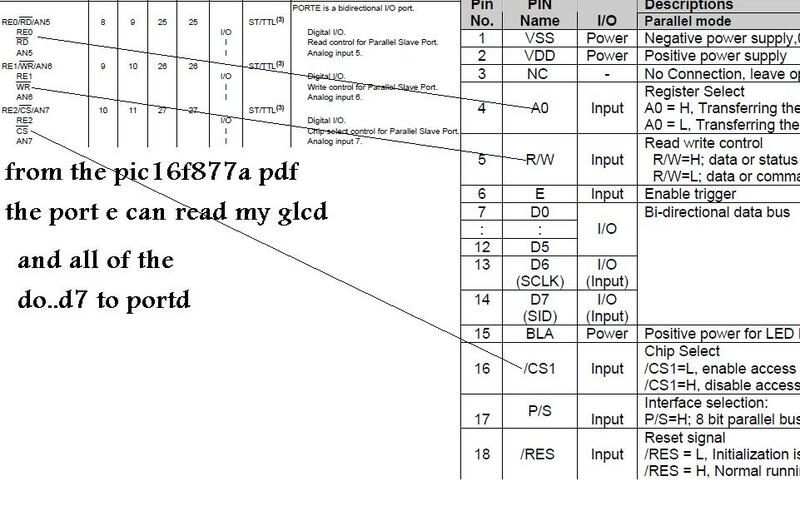 It is possible to write a driver/library routines for the LM13232AFW controller based GLCD, however to give you an example of the complexity of such a task the attached zip file contain the source for the KS108/KS107 controller GLCD. The source code I've attached essentially accomplishes the same task as the MikroC Library. After looking over the attached source code, honestly ask yourself whether or not you are up to the task of writing the source code library for the LM13232AFW controller from scratch/beginning with little or no help. I downloaded the zip file you had previously uploaded and after examining the contents, I found a C source code file demonstrating driver library for the LM13232AFW GLCD. Within the code I noticed the controller chipset is actually ST7565 controller, NOT the LM13232AFW which is the model number of the GLCD. The fact that the GLCD uses the ST7565 controller is better news, while driver source code for the ST7565 controller chipset is not as common as driver source code for the KS108/KS107 controller, it does exist. //      Shenzhen TOPWAY Technology Co.,Ltd. Do you purchase parts from this site? The LM12864LFW GLCD uses the S6B0108B controller chipset, which is actually a KS108/KS107 compatible chipset. The LM12864LFW GLCD should allow you to use the existing MikroC GLCD libraries and should be compatible with the example projects/tutorials I previously posted in reply #16.